This morning was great. A sleep in day. A day where I was able to sleep until my alarm finally brought me out from my slumber at 06:30. Aaaahhhhh.... it's nice to be able to get a few extra winks every once in a while. Normally my alarm does it's best to roust me out of bed at 05:30, and the extra hour of sleep feels great. The reason for the extra hour of sleep is simply that my airplane needs some extra time to "heal" from a small hurt that it sustained some time during my last flight. The engineers here at the hangar weren't able to get everything finished yesterday, and as a result I get one extra hour of sleep this morning that will give them the time that they need to finish up. As I arrive at the airfield, I glance down towards the hangar. MSY (pronounced "Mike,Sierra, Yankee", the registration of "my" airplane) is not parked at it's usual spot, but is still being worked on in front of the hangar. I have a few things to attend to inside our small terminal building, and I go inside to take care of them. After greeting each of my African co-workers and seeing to the things that needed attention, I gather my flight bag and head on down to see what's up with MSY. As I walk up to my craft, two engineers have just finished running up the engine and are now checking things over. Bad news. The work that they have done hasn't fixed the problem. The good news is that we are now sure of one thing that isn't wrong. Thankfully, the next item that is checked appears to be the problem, and is quickly made right. Now I can pre-flight my airplane and be on my way. Today I am carrying two American men from Kajjansi to Soroti, where their church has established a training center for African pastors. As they are battling jet-lag, they are also thankful for the extra sleep that was afforded them this morning because of the delay. We lift off just after 10:30 and head north-east. Because of the late start, there is a lower layer of cumulus cloud that is already beginning to form and I wonder if I am going to have some trouble getting back to Kajjansi later in the day because of weather. Oh well, no sense worrying about it now, the weather is just fine for this leg of the flight. Fifty-eight minutes after lift off we touch down on the long, straight, paved runway at Soroti. After seeing to the bags and greeting the pastor who is there to pick up these two men, I get back to my plane. Climbing up each side of the cowling, I "dip" the fuel tanks, checking the fuel quantity in each one. Satisfied that everything is fine with my fuel, I pull off one side of the cowling to have a look at the work that was done this morning. If something is not right, I'd rather know now than half way through my next flight. Thankfully, everything looks great. 100% convinced that my airplane is airworthy, I strap myself in and head further east to my next destination. My next destination is about as different from my first as it can be. It is a small town named Amudat, close to the eastern border with Kenya. It's a shorter, upslope runway, surrounded with high, thorny bushes. About half way down the strip, there is a 20 degree bend in it, making it look from the air like a boomerang. Also, if I need to abort my landing and go around, there is a radio tower that is placed directly off the end of the runway. These are all things that I need to consider before I land. Then there is the condition of the runway. There has been quite a bit of rain lately and the ground may be soft, especially in the low spot about 3/4ths of the way down the runway. There are often people who play on the air strip or simply use it as a shortcut between roads. A power line also runs near the approach end of the airfield. It follows a road that actually touches the very corner of the strip. If there would be a vehicle that came along at the exact wrong time, it might just continue on it's way with tread marks on it's roof. It's not a "western" runway. This is Africa. As I approach the runway I try to take in all of the information available to me from the air. I see a few dots on the airstrip notice my approaching aircraft and move to the side. Good. The people are aware of my presence and will stay to the side until after I have landed. Although I still need to be aware of those who may run across in front of me, I know that at least the people who I can see have now seen me. I glance down at the road beneath me, and am happy to see that there is no traffic on it at this time. I turn my focus and attention to my approach, and my wheels touch down within about 20 feet of the spot that I had picked out. I'm very happy with the result. The nose of MSY slowly lowers to the ground and I begin to slow down as I bounce over the rough and uneven surface of the runway. Then a sound grabs my attention. "BANG!" It's not something that I have ever heard before. Imagine the sound of two aluminum baseball bats being hit together. That sound, coupled with the nose of my plane being slightly lower than usual, tells me everything that I need to know although I really hope it's not the case. I hit another small bump. "BANG!" Now I am almost certain. I may be here in Aumdat for more time than I have anticipated. It's the oleo. The nose wheel of MSY often takes a beating on the rough surfaces that we are landing on all of the time. As with all small Cessna aircraft, the shock absorption system for the nose wheel is the oleo, a small hydraulic/pneumatic cylinder that moves in and out to absorb the pounding that the nose wheel takes and cushions the ride for the airplane and passengers. Inside the oleo is a small rubber o-ring that keeps the oil on the inside and the dirt and grime on the outside. These o-rings are known to fail, and I am pretty sure that mine has just catastrophically failed. I bring my plane to a stop at the meeting area and shut down. Taking a deep breath, I hop out and immediately move around to the front of the airplane and bend down to have a look. I don't need a second one. The oleo is flat, the only cushioning that is happening now is the less than stellar cushioning of metal on metal. I can't fly with it like this, and I don't have the parts or tools or skill to replace it here. Oh boy. I straightened up to have a look at the people waiting for me. All three of my passengers are here. They have smallish bags that appear to fall within the weight limits that they have been given (not a common occurrence) and they are all ready to hop in and go. What would have been a quick turn around will no longer be. As is usually the case at this airstrip, the police have shown up just to let everyone know that they are here. They have seen me examining my airplane and make their way over. I explain the problem and they quickly understand what has happened. Thankfully, I am not alone. I have in my pocket a cellular telephone. Not only do I have a phone, but there is actually reception here. I call up our chief mechanic to give him the good news. After a short conversation I know the score. There is a way that I can safely make a "bush repair" and get myself and the airplane home, but if I am anything less than 100% sure of my work I will have to wait several hours for a couple of engineers and another plane to come with the parts and do the repair here. I am thankful that there is no pressure put on me to go one way or the other. I walk over to the police and inform them of the parts that I will need to have a try at this. "I need some rubber strips. Bicycle inner tubes or something like that would be the best and would work great. Is there any way that we can find something like that here?" My new friend pulls out his own cell phone and makes a call. As I wait for the results of the call I dip the fuel tanks once more and weigh my passengers bags. If it works, I may as well be ready to go! As I suspected, the combined weight of the three bags is actually 1 kilo less than they are allowed to carry. This is good news. I have enough to deal with right now without also having a weight issue. I haven't even finished weighing the bags yet when my police friend walks up and asks me, "Will this work?" I look over to see three beautiful strips of rubber in his hands. 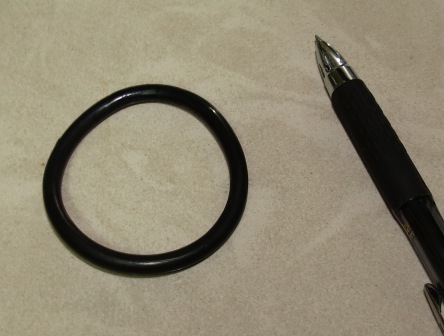 One is a part of an old bicycle inner tube, and the other two are rubber bungee chords that his motorcycle police friend uses to tie items onto the back of his bike. They are perfect. Enlisting the help of several onlookers (the two police included) I make the "repair". The problem with needing help here isn't in finding volunteers, but in managing them in a way that will not actually cause further damage to the airplane because of their exuberance to help. I can't do it without them so I give clear, repeated instructions, demonstrating exactly what is required. With their help, the nose of MSY is raised and I pull out the oleo strut. As I do, my hands are covered with hydraulic fluid that gushes out, covering the nose wheel. All of the white paint on the wheel fork is now a shade of red from the fluid. It's definitely not doing anything productive any more. I take one of the bungees and wrap it tightly around the strut. This rubber has to now do the job of the fluid that is soaking into the red dirt beneath my feet. I tie off the first bungee and turn to the inner tube. It isn't as sturdy as the bungee, but it is wider and I think that if I wrap it around the bungee it may help to hold it in place through the 150 mph winds that it will face during the hour and a half flight ahead of it. Finishing that, I give instructions and the nose wheel is lowered to the ground. I watch the oleo strut disappearing back into the casing, the rubber around it compressing more and more. I hold my breath anxiously, wondering if this will work. Agonizingly, the downward motion of the airplane slows and comes to a halt. I'm not super impressed. It is no longer metal on metal, but there isn't a lot of cushioning action available. I look down at the last bungee. I may as well put it on and see what happens. We raise the nose of the airplane again and I kneel back down, my knees getting stained from the red African earth. This chord I wrap as tightly as I can, hoping that it will not allow the oleo to compress as much as it was. Now another problem arises. I don't have another bicycle tube to secure this one in place. A piece of strong string or rope would be great. I turn and ask the crowd that has gathered if anyone has anything like that which I could use. No luck. I think through my airplane... is there anything in it that I could use? Then I have my answer. Beneath my airplane there is attached a cargo pod, which allows me to carry baggage underneath the belly of the plane. Attached to the door of the pod is a short length of twine that is used to secure the door open when loading or unloading it. I pull out my handy leatherman (pilots don't leave home without them) and cut it off. It works perfectly to ensure that this last bungee will stay secured the whole way home. Now only one thing remains... to try it. If it does work, I don't want to do a short test flight to try it out and end up shortening it's useful life. I load the bags, and my passengers crawl in. I am confident doing this because if the rubber fix should fail upon landing, their safety will not be in jeopardy, only the nose gear due to the metal on metal action. I brief my passengers and we say a quick prayer. I am confident in the work that I have done. In a previous flight instructing job that I had, there was one airplane in our fleet that at all times had a rubber sleeve around the oleo, "just in case". My patch job appears to be doing more now than I ever saw that other one do. As I taxi down the runway to get into position for take-off, I am careful to both try and keep the nose wheel from any visible bumps and to do my best to analyze the "feel" of shock absorption that is happening. It feels normal. There are other things that I can do to help ease the load on the front wheel. As I accelerate down the runway I lift the nose off the ground as soon as possible, employing what we call a "soft field" take off technique. The nose pops off right away and we smoothly lift off into the blue skies. Forty five miles out of Kajjansi I run into the weather that I had seen beginning to build earlier in the day. Thankfully, I am able to find a way around it that only takes us a few miles off course. Nine miles out of Kajjansi the weather clears and the rain stops. I smile. "Thank you God." Now comes the critical part. If my rubber shock system will fail, it will be on landing. I run through my checklists and brief myself thoroughly in my mind for the landing. Just as I used a soft field technique for take off, I will employ a soft field landing technique here. I bear down and focus on my approach. I bring the nose up and the power back mere inches above the runway. Slowly... softly... the main wheels touch down. I hold the nose off of the ground, doing a "wheelie" down the runway as I slow down. Eventually there is no longer enough airflow over the tail to keep the nose in the air and it settles softly onto the runway. There is no banging sound, nothing unexpected or unusual. My passengers have just experienced what will probably be the softest landing that they will ever feel. "Thank you, Lord." Safely home. I could claim the glory for what I was able to do today. I think that it would be foolhardy of me to do so however. It is God who gets all the praise and glory from this pilot. He is the one who called me here. He orchestrated the training and experience that allowed me to do what I did today. He is the one who I prayed to before the flight, asking for both wisdom for me if I should do this flight, as well as asking for safety. It would also be easy to look at things like this as a "one-off", something that many pilots out there could have done. This is also true, but when I see small things that I can't explain happening on every flight, it is easy to see a greater hand at work. I would also like to thank those of you who pray for us. Saying that your prayers mean the world to us is no understatement. Thank you. To God be the glory, great thing He has done! Great post Dallas. Now you have one of those real stories to tell if you ever end up instructing again. Your students will learn the soft field technique well because of it. Rick Willms was full of stories like this. It's also just good to know this is a potential fix for a flat oleo. Nice work...what did the chief mechanic say about your work?